After living in small modern apartments in Berlin, the designer and illustrator Karin Hearn dreamed of a similar simple and cozy house with a studio in her native Perth. The decision came when Karin bought the plot and asked architect David Weir to design a one-bedroom house and an adjacent studio. “The place chosen by the hostess is very beautiful, it is located in the depths of a quiet street, only here it was difficult to build a standard house here,” says architect David Ware. Right in the midst of a tiny patch grew an adult jacaranda (rosewood tree). The hostess firmly decided to keep it, so the house bends around the tree. In the summer, the jacaranda provides a shadow building and serves as a second roof, reducing the heating of the dark facades of the house. Karin´s house built on an individual project and is trimmed with black lining. And the studio is a ready-to-assemble economic block, where the walls of fiber cement are lined with sheets of corrugated metal. “Corrugated plating we were brought from the UK, after Karin saw it in one of the episodes of the transfer of design,” – recalls David. During the construction of the house there was a problem: huge rosewood roots stuck out exactly where the stove was supposed to be. Then the architect decided to raise the stove and install the house on a wooden platform. In a small house there are almost no internal partitions: a simple curtain separates the bedroom from the living room and kitchen. “Rejection of internal partitions and huge windows allowed to create a space that is literally flooded with light. At night, the feeling of privacy is created with the help of curtains, “- says the architect. Large panoramic windows let in enough light and remove the boundaries between the street and the interior of the house. 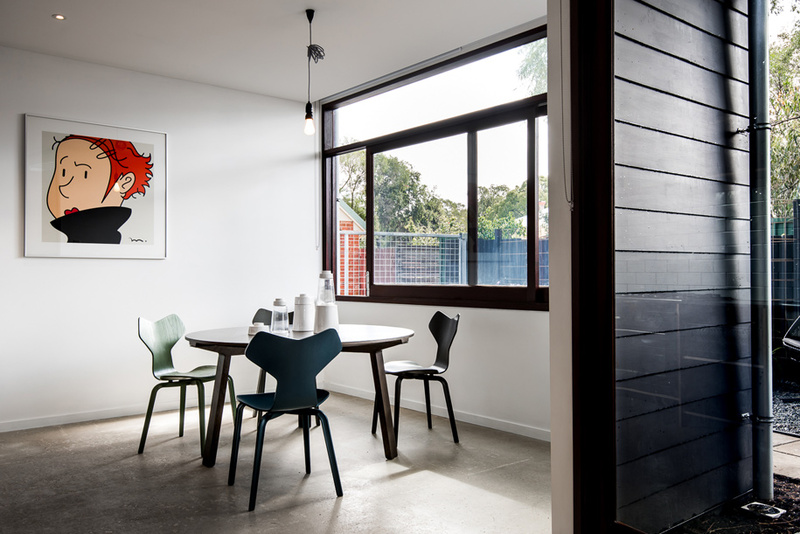 “The house we created is energy efficient: it has good thermal insulation, and the amount of heat and light is regulated by windows facing south and north,” David says. – The sea breeze helps to ventilate the room, easily penetrating the open doors. ” They save energy and concrete floors: in the summer they absorb sunlight, and keep warm in the house in the winter. Large windows of the living room and kitchen open onto the garden. In good weather, the house seems to merge with the surrounding space, wrapped in huge branches of rosewood. All the walls in the living room were painted white, against which background Karin’s bright works look especially advantageous. The doors inside the house are bright orange. The same color – a window opening in the ceiling of the bathroom. “Instead of glass, we used orange polycarbonate, and when the sun shines through this window, the entire room radiates an orange glow,” says the architect. The walls in the studio of the hostess are sewn with plywood with rough rough texture. The yellow sliding doors open directly onto the street, inviting guests or customers inside. The south wall of the studio is made of corrugated polycarbonate, allowing soft light. The material, suitable for the outer covering of the house – from corrugated metal, – had to be ordered from Italy.